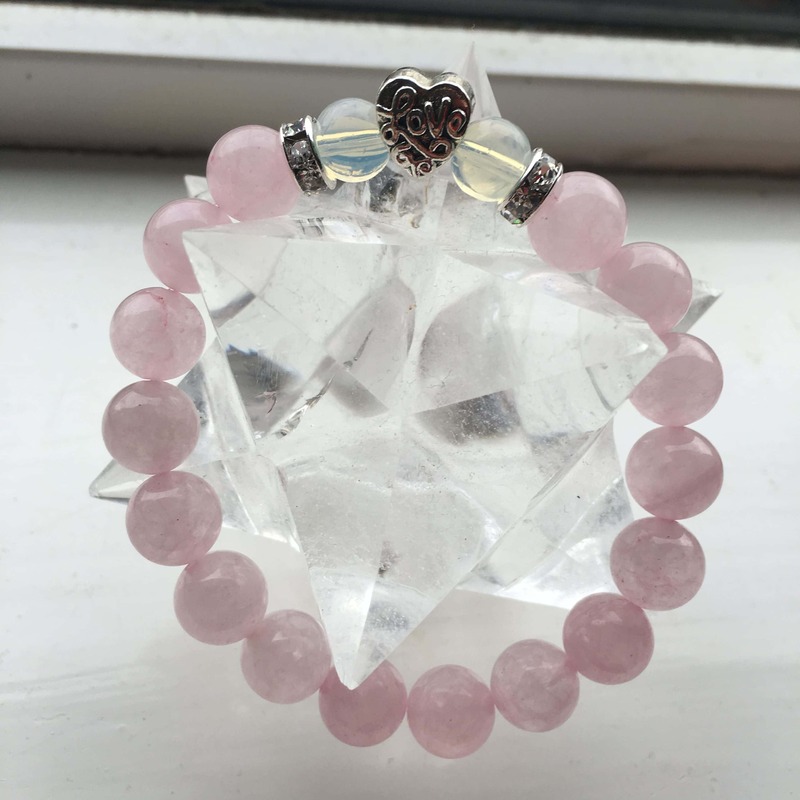 Abby will connect to your unique energy blueprint, send you energetic healing, and then will create a special healing bracelet made from natural crystals to your specifications, and imbue that with more healing for you. I made crystal bracelets for my family as gifts over the holidays and I discovered that as I thought of each person, I was tracking their energies, sending them healing and then making natural crystal bracelets for them almost like a prescription, to help bring them into balance energetically. Each bracelet was totally different depending on who it was for. 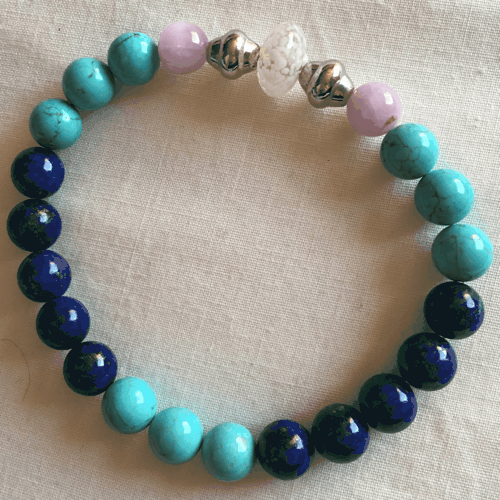 The healing went into the bracelet, (crystals are wonderful for storing up healing energy) and I gave them as gifts without telling them what I was doing. Each person that received a bracelet loved it immediately, in fact my mother cried when she saw hers. And they still have not taken these bracelets off! Since doing this, I have made more bracelets for friends, and I have made them for me too! I find them a great solace and support – eg. 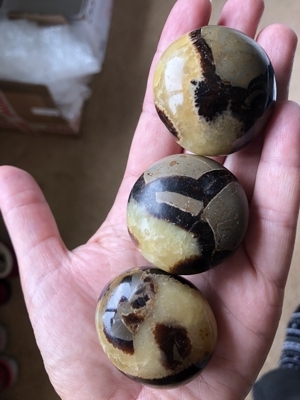 when I feel I need balance I choose grounding stones, when I want to manifest something I choose stones that support me in that, I have bracelets that I have made for increasing my intuition and stones that help me connect to Spirit. 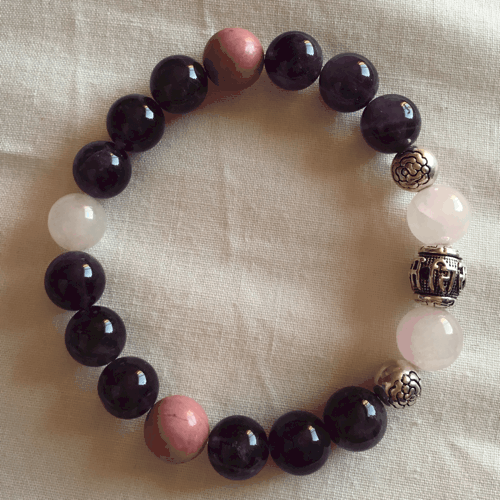 Click here to find out more about what these bracelets can help you with. 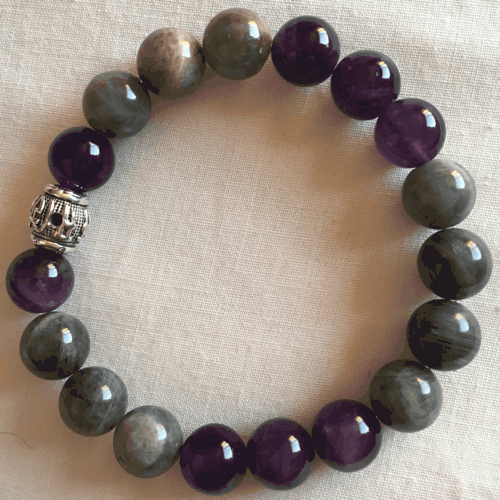 I thought I would now offer this as a special limited edition service, where I only offer 4 of these special bracelets per month as they take time for me to create. 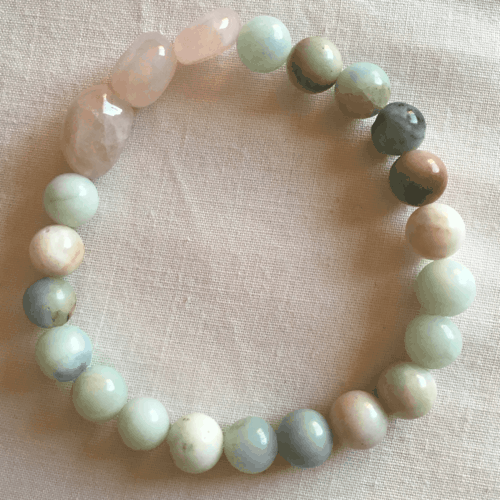 Once you purchase a bracelet from me you have the opportunity to let me know what you feel you need the healing for, and if you have any special request for intention to be added to the bracelet. I will journey to your unique energy signature to get a reading from your biological energy field as to what it is that needs to be balanced and healed. 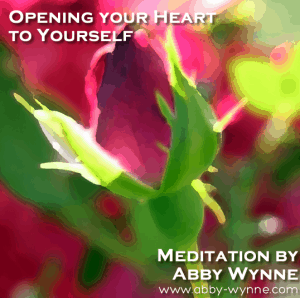 I will send healing to you to clear, balance and heal your energy field. 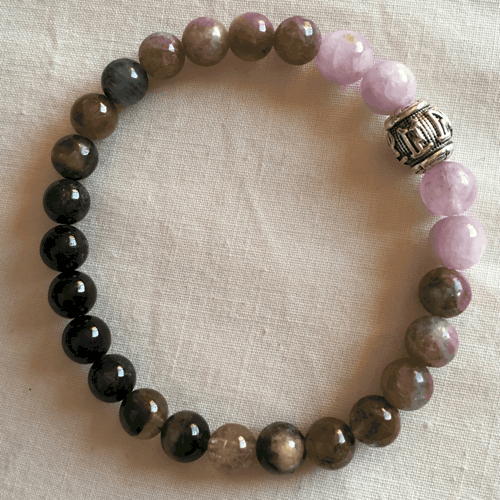 I will then create a special bracelet for you, made of natural crystals, to encapsulate the healing I have just sent you. 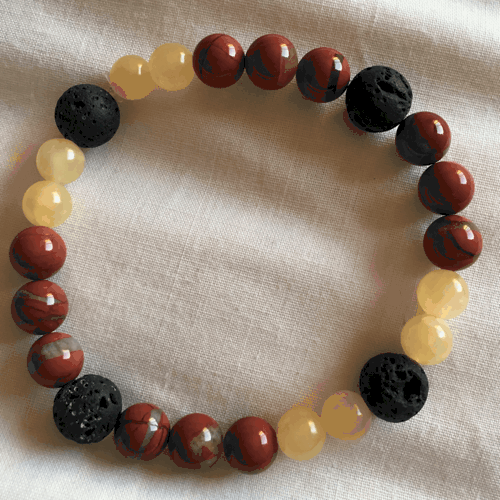 I will fill the bracelet with healing and ship it to your address, along with an explanation of the stones I have chosen for you, the function of each stone and any recommendations I have for you based on the healing I have done. The images in this product are sample bracelets only. Your bracelet will be created specially for you and will be unique specially for your needs. I really wanted to buy one of your bracelets and I couldn’t decide which one to get, so I took the leap and got a prescription bracelet. 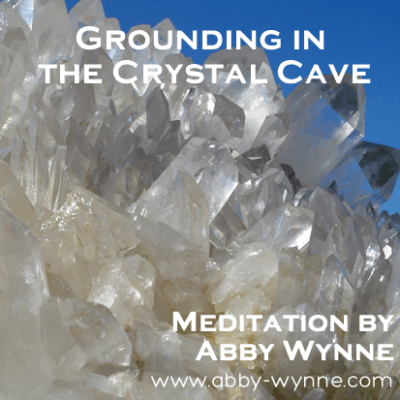 As soon as I emailed Abby and told her what I wanted it for, I knew I did the right thing, I felt an ease come into my heart, and I felt more grounded. I wasn’t waiting for it for very long, only 10 days, and when I opened it I must say it was a wonderful feeling to receive it! I have been wearing it every day for the last week now, each time it catches my eye it fills me with a calmness to know that I’m supported and loved. I have even used it in meditation, repeating a mantra with each bead, to still me more into the present moment. Thank you Abby, it was a leap of faith, and it has brought me more joy than I could have imagined. I’ve been wearing my bracelet for a couple of weeks now. I love it. I’ve tried the meditation that you suggested with it, I know I need to work on that more. But I have time! Thanks so much. Abby asked me to write a review I have trouble with these things! But this bracelet is wonderful so I guess I want to share that. If you’re thinking of getting one, do. The healing session helped me feel so peaceful and relaxed, and since it happened I wake up every day feeling like something has changed in my life, in a good way. And then I look at the bracelet and I know that it’s true. I wasn’t sure at first, I was drawn to one of the pre-made bracelets, but I went for it anyway. I’m so glad I did. I felt the energy from Abby as soon as I booked the bracelet. And when she sent me a report it was as if she knew exactly what had been going on for me. And the bracelet, well, when I opened up the package I cried. My eyes out. This bracelet means so much to me. And there’s no other one like it in the world, that is incredible to me too. Magical. Feeling so much better after this session, and I have the bracelet to remind me. 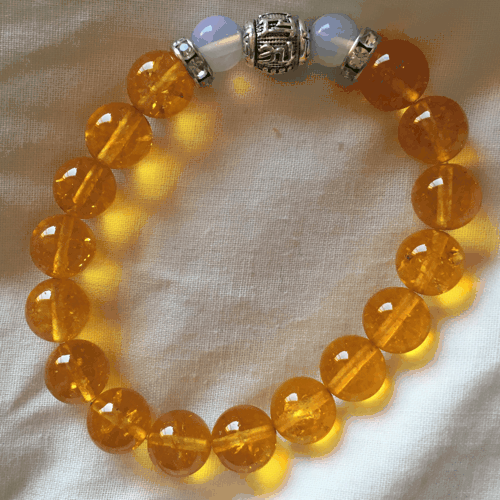 My bracelet arrived today and I am so pleased, it is amazing how you have really understood what I need to help balance and heal. I am working on remembering what each stone represents, I have got as far as Sunstone …. will see if I have it firmly in place by morning ! Am so glad I got in touch and feel I have something very special to tune into at moments of need. Also love the symmetry of the stones, you have made me something very special. Thank you so much Abby for creating this lovely, healing bracelet. It will be treasured.